AP Photo/Greg HorvathThe 1794 Fallen Timbers battlefield monument near Toledo honors both the victorious forces of U.S. Gen. “Mad Anthony” Wayne and fallen native Americans led by Miami Chief Little Turtle. This photograph was taken in 1994. So many had flooded into this frontier land — from the East Coast, looking for cheap, fertile land; from slave-owning states, wanting to live in a slave-free area; from eastern cities, looking to profit on land speculations — that Ohio had almost reached the magic 60,000 number needed to become a state. It achieved that milestone in 1803. These newcomers had headed for Ohio despite a series of shockingly violent wars and raids in the 1790s pitting early settlers against indigenous Indian tribes determined to hold on to land specifically guaranteed them in a 1768 British treaty. An equal thirst for territory propelled the migrants, however — the same inexorable expansionism that set the stage for Ohio’s part in the War of 1812, which started 200 years ago this month. The war, as it was fought in Ohio, was in many ways the logical extension of more than a decade of Indian warfare for title to this verdant tract of land. Even before war was formally declared on June 18, 1812, the enterprise was viewed with far more enthusiasm on the Ohio frontier than in Philadelphia, New York or Washington. While East Coasters fretted about the serious economic repercussions, Ohioans correctly understood the stakes as nothing less than control of America’s frontier, the key to the American experiment. For more than a decade, folks in Ohio and neighboring Kentucky had been on the front lines of a series of Indian wars fought with the help of British weapons and other provisions. Long after the Revolutionary War had ended, it seemed to many local settlers that Britain was determined to kill the United States through its back door, using indigenous tribes as proxies. While that impression was exaggerated — the British were much more interested in preserving their stake in the lucrative fur trade than in starting another expensive war — British officials delayed enlightening Indian allies about their narrow aims, or about the 1783 treaty ending the Revolutionary War, when Britain had ceded to the fledgling United States the entire “Old Northwest” that the tribes considered theirs. The ceded land included all or parts of what was to become Ohio, Indiana, Illinois, Michigan, Wisconsin and Minnesota — although Britain kept armed forts in the area, ostensibly to secure its fur-trading interests. In this way, more than a quarter-million square miles of prairie, deciduous forests, rivers, swamplands and fertile land became the logical pathway for U.S. expansion — America’s “manifest destiny” long before the phrase was coined. That’s also why the 1790s Indian wars naturally morphed into the War of 1812 — which did settle, once and for all, America’s expansionist destiny westward, although not northward into Canada, after several invasion attempts failed. No mere skirmishes, the 1790s wars involved pitched battles by a federation of Indian warriors who knew the stakes, acting in concert under skilled military leadership — and exacting, in 1791, what’s still the worst single-battle U.S. Army loss against Native Americans. On Nov. 4, 1791, on the Wabash River near present-day Fort Recovery in western Ohio, more than 600 U.S. Army officers, men and militia members under the command of Arthur St. Clair, an aging Revolutionary War veteran afflicted with gout, were slain, along with hundreds of their camp followers, during a surprise attack by 1,000 warriors led by Miami Chief Little Turtle and Shawnee Chief Blue Jacket. That was more than twice the casualties of the 1876 Battle of the Little Bighorn. The sweeping 1795 Treaty of Greenville was supposed to put the Indian claims in Ohio to rest. That treaty followed the trouncing that troops led by U.S. Gen. “Mad Anthony” Wayne dealt to a united force that included Shawnee, Wyandot, Delaware and Miami tribesmen at the 1794 Battle of Fallen Timbers, in present-day Maumee. But the 1790s wars did not resolve all of the competing claims. When Ohio Gov. Return J. Meigs Jr. called in April 1812 for troops to assemble in Dayton — months before war was formally declared — so many showed up to fight that the Army didn’t have supplies for all of them. Qualified commanders also were in short supply. 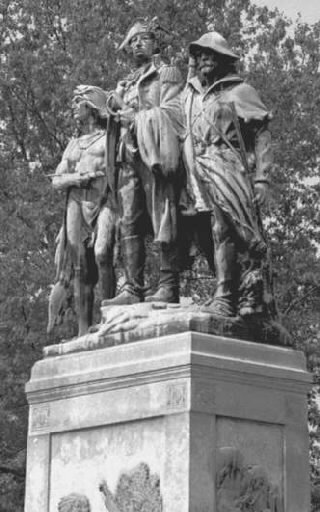 Local militias near Dayton had to take up armslater that summer to defend the area’s settlements, after the ignominious capitulation in August 1812 of William Hull, another ailing Revolutionary War veteran, who had shockingly surrendered his Ohio and U.S. troops at Detroit to a smaller British-American Indian force, virtually without firing a shot. Fortunately, other U.S. forces had more success. And the magnificent victory, in September 1813, of Master Commandant Oliver Hazard Perry in the naval Battle of Lake Erie was a strategic triumph that cut key British supply lines, although it would take another year to end the war. By 1820, more than half a million people were in Ohio, many hoping to make their fortunes, others heading elsewhere. I was amazed to see, when I looked closely at the census earlier this year, that no fewer than 10 of my direct forebears were in Ohio by 1820. Thomas Crook, my great-great-great-grandfather, briefly served in the 1812 war at Fort McHenry in Baltimore, according to his sworn affidavit, then moved to Wayne Township northeast of Dayton — named for the general who’d defeated Native American forces in 1794. Many of Wayne Township’s early residents were veterans of the Revolutionary, Indian or 1812 wars. One of Crook’s younger sons was George Crook, a West Point graduate and later famed Indian fighter who became an early champion of Native American civil rights. Gen. Crook’s attempt in the late 1800s to seek redress for the broken promises to Apache leaders and others whom he’d first fought and then befriended was a lonely battle that alienated him from some of his oldest military friends. But it suggests how combat veterans often see war — as a failure to act decisively to redirect the elements that are spinning out of control and propelling conflict and violence. Gen. Crook, who was born on the Ohio frontier a dozen years after the War of 1812 ended, would have grown up surrounded by men who understood that. Sullivan is The Plain Dealer’s editorial page editor.